If you're reading this, it probably means you're also awake at 4:30 in the morning. In my new life as semi-professional baker for Bang Bang Pie Shop I keep the hours of a farmer. That means waking up before the rooster crows and going to sleep sometimes before the sun even sets. That being said, it beats the hell out of corporate life. I'm on a vision quest folks, I'll see ya when I run out of peyote. The plus side is that it's really brought my cat and I closer together. In the case of yesterday morning, Baby Toulouse's never-ending appetite for crushed up pretzels and water got me out of bed on time, after I slept through my alarm. I'd say sorry for the long gap between posts, but if you're really that into my blog, your life is probably sad. Life has become a parade of carbs. My food groups consist of biscuits, pie and occasionally (all the time) a stray strip of candied bacon. Back before my plus-one skipped bail and fled the country - we used to have a Pasta Sunday every week, whilst watching politically contentious documentaries on Fatflix. Translation: Married Old Couple Night. We figured it was okay to eat pasta once a week, as long as we ate well-ish during the week. Several dozens of biscuits later, I still think I've earned my pasta! 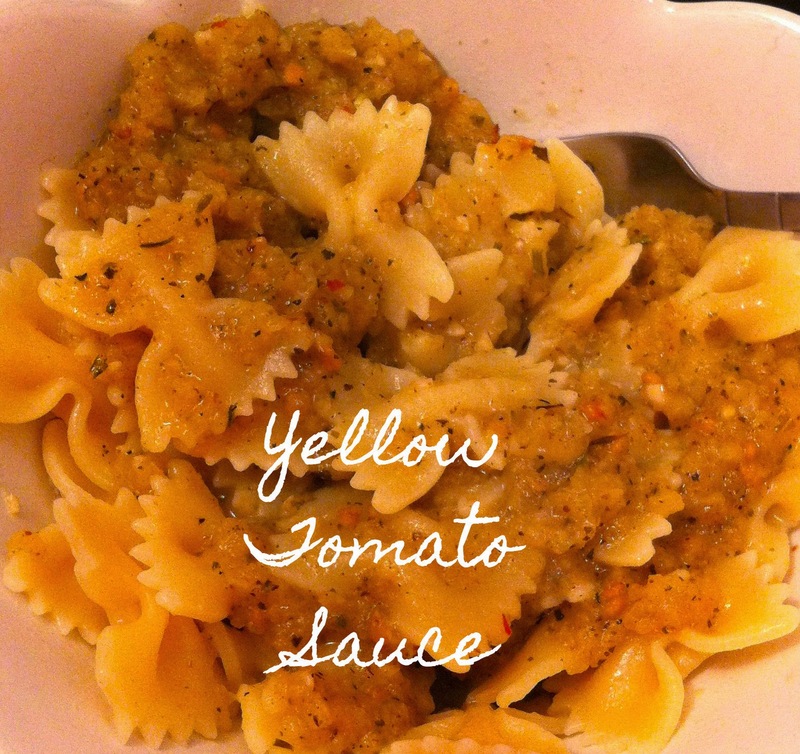 Yellow tomato sauce is one of my favorite recipes. It's one that makes people say, "yellow tomatoes?" and that feels pretty special. I've been on a tomato bender lately as we keep a community garden at work. Unfortunately I bought these tomatoes at Marianos. They weren't that great, but what can you expect in late September. The sauce was perfection though. Step 1: Start your oil in a heavy-bottomed pot. Toss in chopped onion, fennel and spices. Cook til translucent. Start a small pot of water boiling. Prepare an ice-bath. Cut small Xs in the bottoms of your tomatoes. Step 2: Dunk tomatoes in boiling water for a second or two. Drop in ice-bath. Watch as the skin magically lifts off the tomatoes. Now is the time to toss in your chopped garlic in with the onions. Step 3: Chop your newly peeled tomatoes into large chunks and toss into the pot. Let them break down until they fall apart. Add vermouth and let simmer for a little while. Step 4: Yupp, I'm already annoyed about it too. Haul out that food processor you use once a year and blend this down as far as you think it can go. Unless you like your sauce chunky. Let simmer on low heat for at least an hour. Or 15 minutes if you're in a hurry. The longer it sits the better it tastes, and it thickens up. Thickness matters.